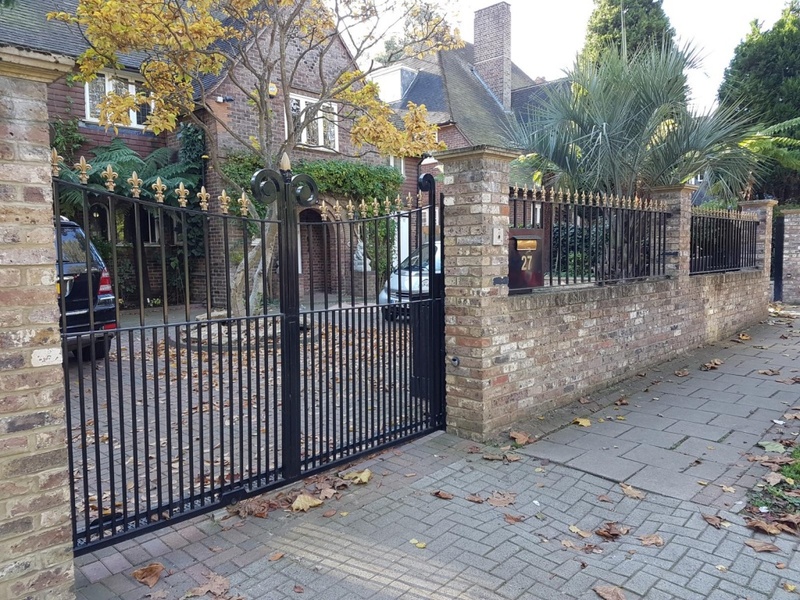 We can automate, motorise, intercom and CCTV new and existing iron gates. Automated Iron Gates – Do you know what you want? When it comes to automating metal gates and providing intercom systems our experience has shown us the first thing to do is to really understand what our customers want to get from their automatic gates. There are some exciting features out there at many different level pricings. Altering your chosen options halfway through a project is costly, time consuming and requires more admin from either side, therefore the consultation process at the beginning is so important. Some customers have near fully developed ideas about what they want from their automated gates other just know they want them automated. Please help us help you by reading the following passages and browsing our photo gallery. We like nothing better than automating our Driveway Gates. We able offer a range of automation and Intercom systems. We use Hydraulic Ram motors which make light work of moving the heaviest of Metal driveway gates. Swing gates are double leaf gates. They can be automated in two ways. Bi-Fold Gates are like Swing gates in that the gate is split into two leaves. The leaves of a folding gate are made such that each leave also folds in on itsself as the gate opens. This reduced the arc of the gate. This means that less space is needed behind the gate when it opens. This makes this style of design suited to smaller more compact driveways. Sliding gates are a solid, continuous piece metal. The gate runs along a track which is set into the ground, below surface levels so cars do not travel over it. The gate will run along this track behind a wall. You will need to have clearance for the entire length of the gate plus a meter or so.The motors are above ground and contained within Weather Proof casing. Running the power cables to the gate. If you already have your driveway surface laid, then the wiring will need to be run above ground. This will usually mean that cable will need to be run around the perimeter of your driveway. If you are able to install the gate first before surfacing then this will be advisable as this will enable you hide the wiring. Depending on the surface covering you have there we may be able to cut a trench of the wiring, though finishing of the road surface likely to be markedly different from the original covering. Whether the cable is run above or below ground the wire will be armoured cable, which it coated in a thick plastic for protection. ​If you are going to use your own electrician to run power to the gates we are happy to talk to them about our requirements, and how they should leave the power for us at the main gate. How do Visitors leave the premises? Works much like an old style telephone in that you have to go to a fixed position within your home and grant access to those at your gate. Here you have video Which shows the person’s face, the person’s vehicle or both. The Technology can also be used to grant access to people wishing to enter the property. This has two benefits. First it means that you will not have to go to a wall mounted intercom system which is usually located near the street door. Secondly if you no one is at home to grant access the system can be set to call your phone and you can decide whether to grant access. Grant Access to your property from anywhere in your property, or indeed the world. The person standing at your gate will speak into the intercom and you will hear via your mobile phone. If you have a Video Intercom installed you will be able to see them via FaceTime. ​Please note if you do decide to go with a GSM system they will require a SIM Card which will mean a small monthly charge which will go to the network provider.